Joan updated the record board and the current 1600m times. Hopefully we have a lot of changes to make at the end of the XC season! 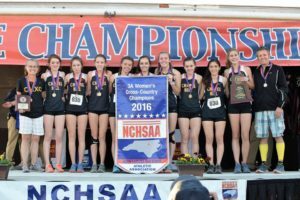 Boys and Girls Come Home with XC State Titles! What a way to finish the season! Two state 3A team titles! 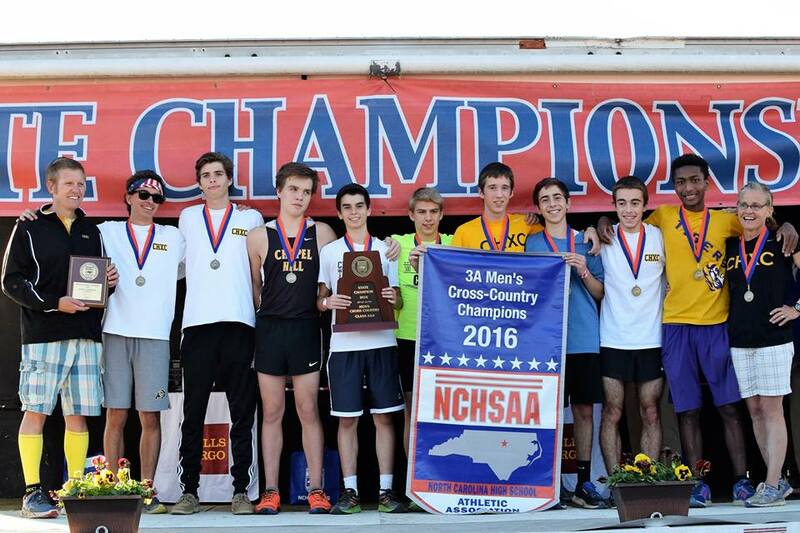 The senior boys’ class were 4th as freshmen, 3rd as sophomores, 2nd as juniors and now end their careers with a state title. The girls finish the season with their second consecutive state title. 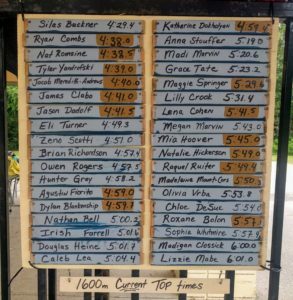 In many ways this was a very difficult season right from the start with freak injuries sidelining some of our top girls from the camp race all the way up until the day before the state meet. This was not the prettiest of victories but we’ll certainly take it. 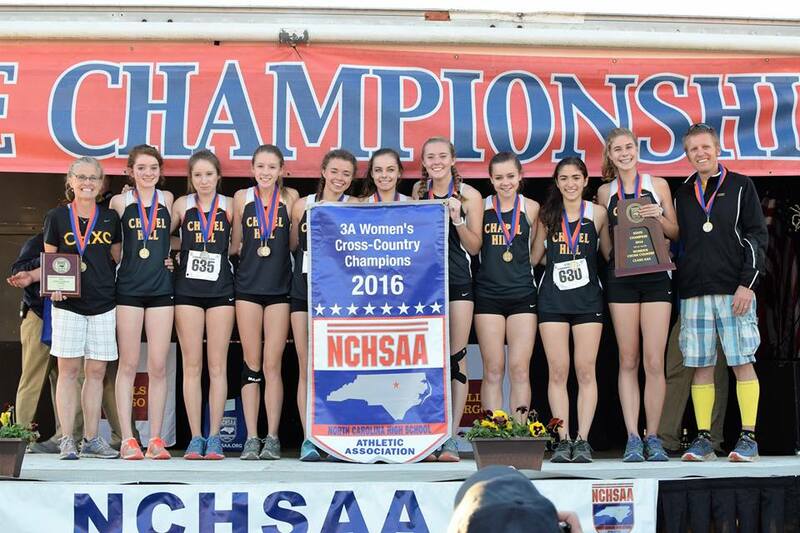 Here are boys’ results and girls’ results from Milesplit and a link to our CHXC times database. 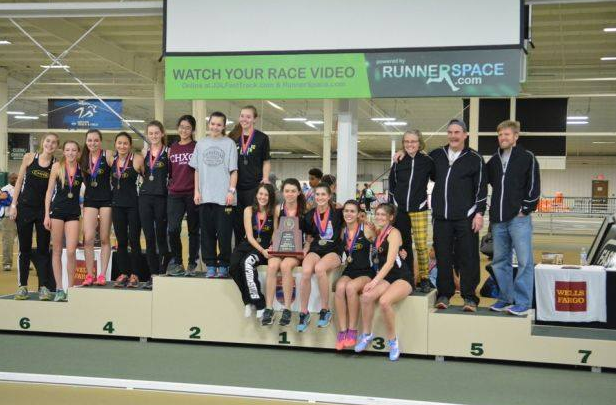 The girls team won the indoor 3A state championship at the JDL fast track in dramatic fashion. The boys team had their best ever showing at the meet finishing 18th out of 41 schools. 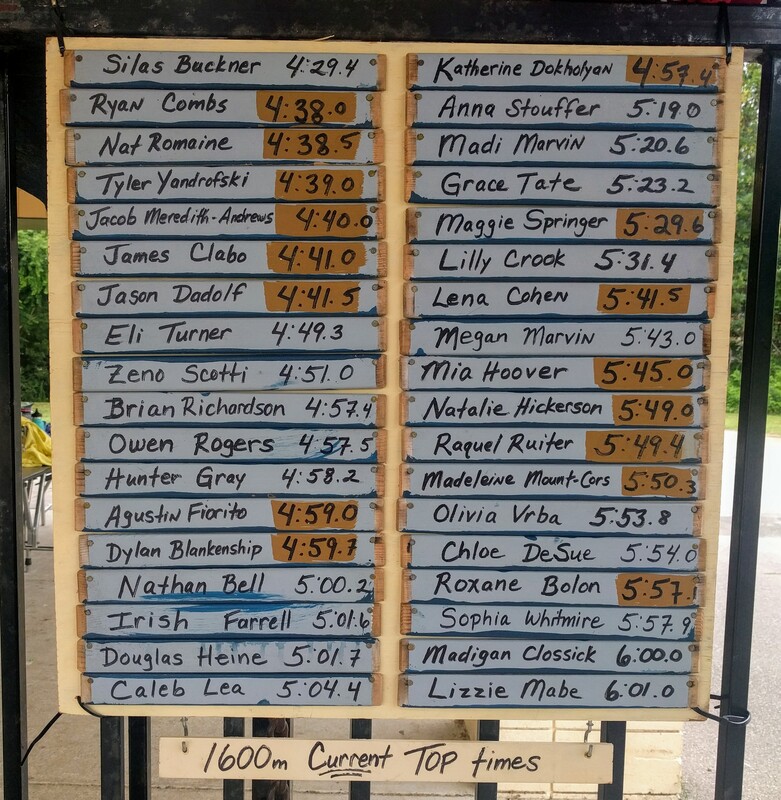 The girls team competition was very tight all evening and after a great performance by the Tigers in the two mile, the score was tied with one event to go – the 4X400m relay. The score was Marvin Ridge 54, Chapel Hill 54, and West Carteret 53, all with relay teams in the final event. It couldn’t have been more dramatic! It’s fitting that Anna Passannante got the baton for the final leg and sealed the team title finishing second overall in the event and just ahead of Marvin Ridge. The Tigers claim their first ever track state championship on the boys or girls side. Full recap of the meet here. 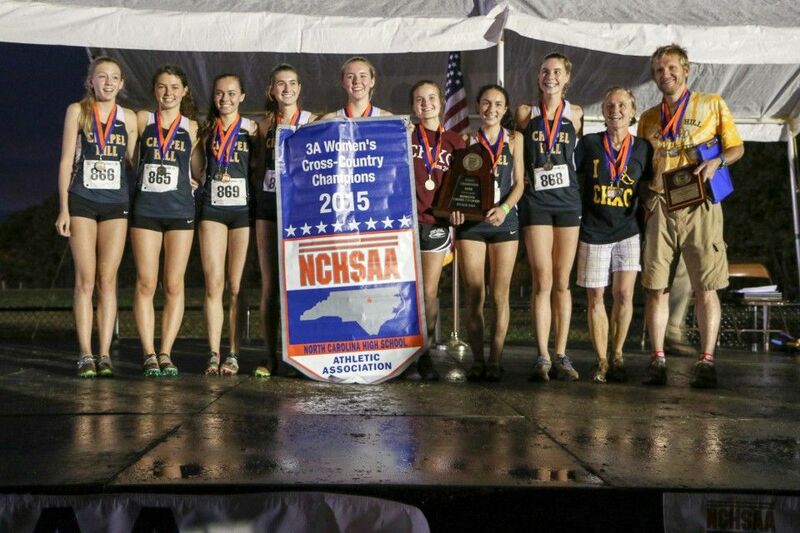 Girls State Champions, Boys Runners Up! We are thrilled with how the season finished up! 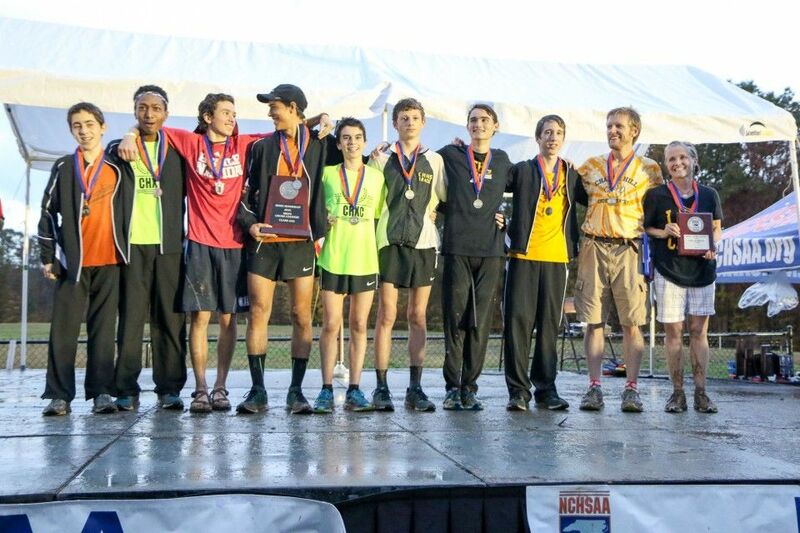 The state meet at Ivey Redmon park couldn’t have gone much better for the boys or the girls. On a wet but not too cold day the boys started off by finishing second to Weddington after being ranked fifth going into the meet. Ryan had a great meet finishing 18th place as a sophomore. Dan finished with an all state performance coming in 10th. Great races from the other varsity boys solidified our number 2 spot. The girls got the worst conditions of the day running the last of 8 races. The course was slick and sloppy. 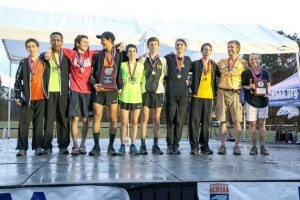 It was predicted by some to be a tight race but CHXC dominated the race from the gun. Katherine finished second to multi-time state champion Anna Vess followed closely by fellow Tiger Clare who had a breakthrough performance. Both were all-state as was Marija coming in 5th. It was so thrilling to end the season on such a high note! We had two records broken this spring. One was Harrison Young breaking the 5 year old 400m record formerly held by John Michael Chelminski (50.64). Harrison ran 50.47. 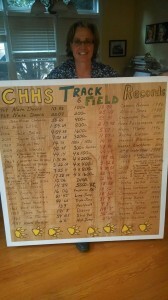 The other record that was broken was the girl’s 1600m formerly held by Angie Morey from 1996 (5:07.1). Sophomore Clare McNamara crushed it by over two seconds in 5:05.01. 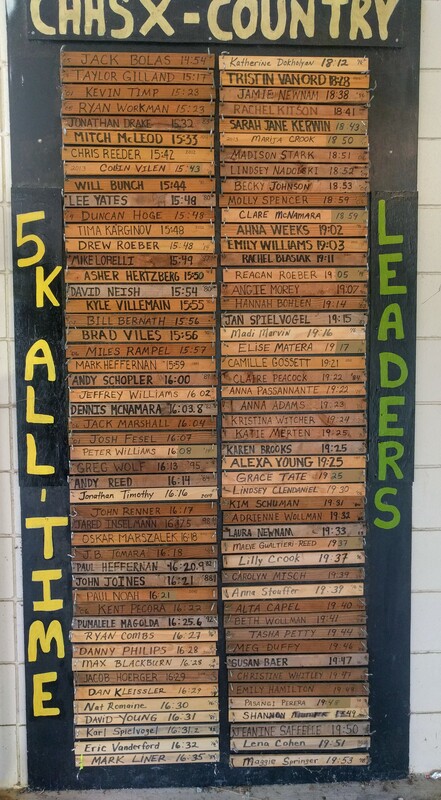 Current XC and Track records can always be found here. 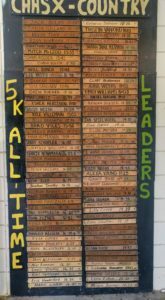 After Footlocker we updated The Board with 3 updates to the boy’s side and a whopping 10 updates on the girl’s side. 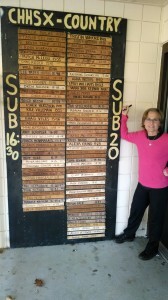 Here’s Coach Joan after installing the new boards. Current board contents are always available here. 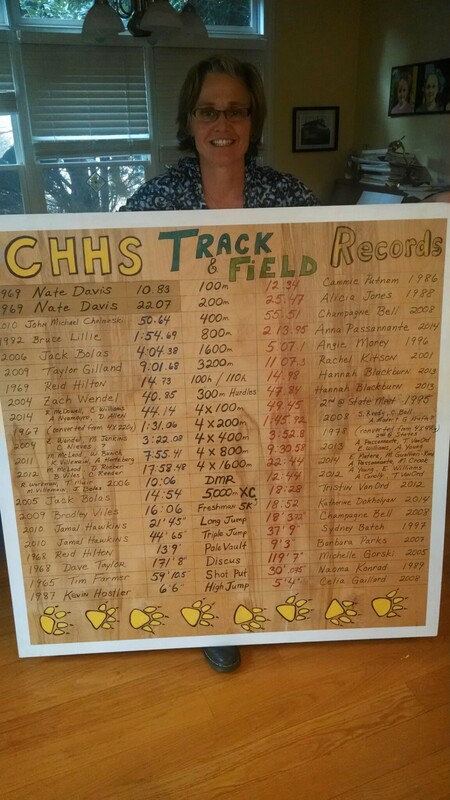 Joan has been working on a Chapel Hill High track record board to display at the track near the tiger. Prior to Joan’s arrival the records were lost to a hard drive failure so she’s had to piece bits of information and results together from scratch. She spent a morning in the school media center looking at old yearbooks from the 1960s to track down the correct results. She spoke with Chapel Hill 1969 alum Nate Davis who now works in the local Parks and Recreation department. 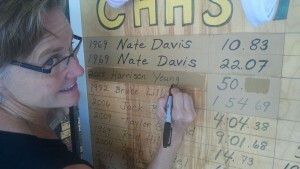 He confirmed some results and is trying to track down the relay members of the school record 4X200m relay. 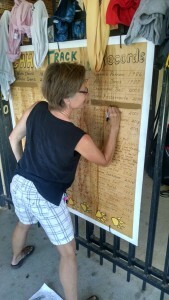 Here’s the fruit of her labor – to be mounted at the track soon! Winter Training Starts December 8! 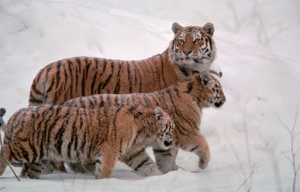 Winter distance training starts December 8!